Perform 1: What Holds You Back? Pretty straightforward, right? My current athletic goal is to compete in the Training 3 Day at Rebecca Farm in July 2018. See how I’ve made it specific, measurable, and time oriented? A weak goal might be something like “I want to be more active” which could be replaced by “by November 1st I want to have worked out in the gym doing cardio & weight training for 45 minutes 3 days/week”. Goals can vary in topic from athletic, work, home, and school performance to simply your mental health/state. Don’t limit yourself! Identify the number 1 goal that will most positively impact your life in the next year. The next step is becoming clear in how you plan to reach those goals. For example, for my goal I needed to get my horse cleared by the vet, put him on a joint supplement, make sure he is getting worked 5 days/week, and look into/compete at some local shows. I want you to take your primary goal right now and think about the actions you need to take to actualize that goal. Finally, write it all down!! You need to make your goals concrete and the best way to do that is write it all down. I don’t care if it’s on your phone, on a piece of paper, or written in lipstick on your mirror- simply have it written. I am a class A procrastinator. I have friends with whom we dubbed ourselves “Procrastination Partners”. It’s bad. Physical health. I deal with respiratory infections on the regular which have impacted many of my goals. We all have things that hold us back. In general, as a society we tend to be uncomfortable with our “areas of growth”, but recognizing them and meeting them head on is the absolute first step to dealing with them. 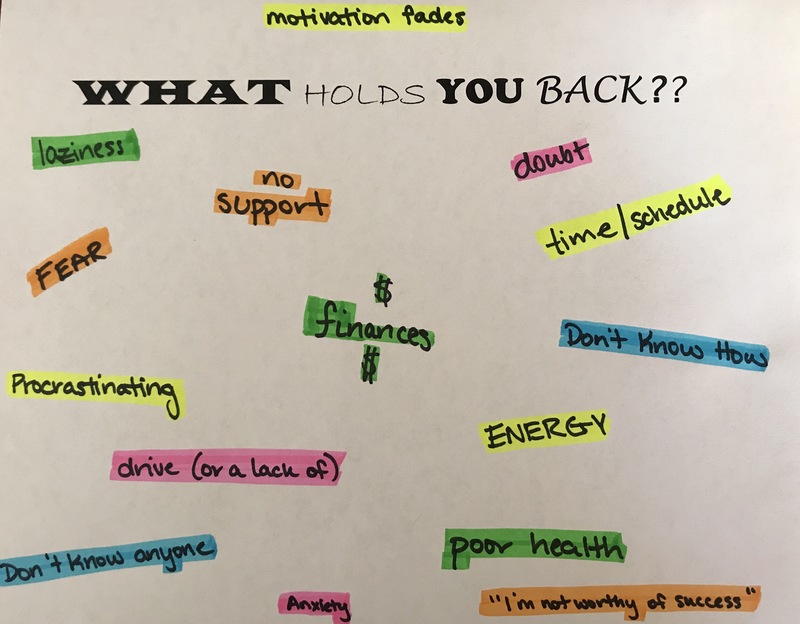 What holds you back can be anything, but usually falls into four categories: your situation (what is happening around you), emotions (fear, anxiety, etc. ), thoughts (“I can’t do this”), and behavior (sitting on the couch instead of doing something toward your goal). Try to evaluate each category and think about your primary obstacles. In the next blog, we will begin to break down some of those barriers to your goal. I look forward to chatting with you then!